I'm getting ready to swap my cam. Ran across a good deal on a set of AFR 165 heads so going to swap out the heads too. They are also coming with roller rockers and valve springs but the springs are of unknown rate. In order to be sure they are in spec for the cam, I'm going to check them using this drill press/bathroom scale approach (except I'm going to substitute some plate steel for the wood piece). Assuming they won't all measure out exactly the same, how much variability between the springs is ok? As a reference, here is what I have, and no issues going to 6,000 rpm. AFR 1399 Renegade, 58cc stud mount. 1.6 roller rockers, Comp 35-349-8 cam w/212/218 duration @ .050" and .512 lift. I'm certain the AFR heads with supplied springs were good for up to .600" lift. and the fuel economy seems decent, although it's not a priority. Small issues have kept me off the dyno, so no data available. That's the thing Dennis. Heads are used and valve train is disassembled. Seller *thinks* the rockers are 1.6 Harland Sharp and has no info on the springs. So, I'm taking a chance that parts were well selected and will work with my cam. But, I want to verify before putting it all together. the outside diameter? I have the AFR spring info, but a match could be a swag. Any skilled auto machine shop will check your springs, height/rate, on the cheap. You can buy a spring tester, Jeg's /etc., up to 600 lbs., pretty cheap. Also use it to weigh things. I made an adapter, to weigh under tension,(something on a hoist). art. Got these rockers with the heads. Seller said he thought they were Harland Sharp, but they don't look like it to me. Trolling pics on the web, they look like they could be Comp or Crane but not sure and there are no markings except the 1.6 ratio and a single digit number. Anyone recognize them? Edited 1 time(s). Last edit at 12/15/2018 10:48AM by rficalora. All the Harland Sharp roller rockers that I have ever seen (put them in my Camaro over 25 years ago) were orange. They look more like the Speedmaster DNA rockers than anything else. Agree Carl - orange & way more refined in their machining. I don't think these are ProComp (Speedmaster). 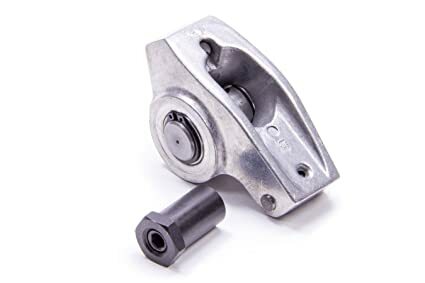 Looking on my PC @ SummitRacing.com (yesterday I was just on my phone so harder to see), they look like they are "Crane Energizer Roller Rocker Arms 11746". The ProComp ones I found are similar, but didn't have the ratio in the middle circle on the top & the edges actually look to be sharper; almost machined looking. Rob - I know you don't want to spend any money you don't have to BUT I have found that buying used parts you rarely get what is represented by the seller. I would step up and buy new parts (especially lifters) that are specified by the cam manufacturer as compatible with the cam. Be sure to do a length check on the push rods also since you don't know what machining has been done on the heads. I would also degree the cam and not just on one cylinder - the cam that came with my head porting job had wild variations between cylinders. I sent it back to Advanced Induction and they had it checked by a Nascar engine shop and they confirmed what I had found - they changed cam grinders after that. I would also at least check the valve seal by pouring some solvent in the chamber and see if any leaks past the valve. Good info Jim, thanks. I am awlays on the hunt for deals and so far, it has worked out. I got these heads, rockers, springs, push rods and lifters for just $630 so was pretty sure it was a reasonable deal if all I used was the heads and valves (none look burned or otherwise damaged). If the rockers are good, that's a bonus. I don't trust the springs or lifters so was thinking to measure spring rate (original post) and then check cam specs for requirements. For lifters, rather than use the ones I got with these heads, I was planning to use my existing ones - <25k miles on them. I hadn't looked into push rods, but I plan to take the heads to a machine shop to see if they need a valve job, make sure they aren't warped or cracked, and find out if they've been skimmed in the past (and if so, by how much). I'll also have them measure the push rods (I don't have an accurate caliper that big). With that, I'm thinking I should have the info needed to determine whether to use the ones that I got with the heads or use the ones on my motor currently or get new. I'm also assuming head gasket thickness can affect rod length, but haven't checked into that. Edited 1 time(s). Last edit at 12/16/2018 04:39PM by rficalora. Not the "ProComp (Speedmaster)", the backside is tapered more like the Speedmaster DNA rockers. Not "Crane Energizer Roller Rocker Arms 11746", either. Edited 1 time(s). Last edit at 12/16/2018 06:43PM by MGBV8. I see what you're saying Carl. I haven't found a pic of the Speed master DNA except some black anodized ones and those appear to have more refined machining than the ones I got. But, the pits in the casting on mine make me think they're lower quality - especially since they don't quite match the Crane shape at the back. Seems there are a lot of Chinese roller rockers these days. Some of the better quality rockers. "Definitely an older Energizer design. The current part number is the 11746-16 for the Ford 302. It is a little different in the body design but it is the same rocker." I was wondering about that while searching images. All the images are of the latest offerings. How to search the older products?